Here is a list of the best QuickBooks troubleshooting techniques for working through any problems you may have. After writing about QuickBooks for more than 20 years, I’ve had a revelation of sorts: People want not only specific, step-by-step information about how to use the program, but also troubleshooting advice. They want techniques and tactics that they can use to solve the inevitable problems that they encounter while using QuickBooks in real-life settings. I know what you may be thinking: You have some problem that you can’t solve by using Help, and it’s either a bug or some glaring error in the QuickBooks documentation. In fact, upon further reflection, you may be thinking that you’ve encountered some problem that you can’t possibly solve by consulting the QuickBooks Help file. But in my experience (gleaned from talking with people who have problems), about half the time, the problem is lack of knowledge about QuickBooks. These users may simply be experiencing a mechanical problem. They can’t make the program work because they haven’t used QuickBooks enough to figure out the problem. Therefore, the right way to solve this sort of problem is to find out more about QuickBooks and try again. If you’re having problems printing a report, for example, just finding out more about both printing and reports may enable you to solve the problem. In most cases, you should be able to find the information in this book by using the index or the table of contents. Also, you usually can find the information (perhaps in a slightly less-friendly form) in the QuickBooks Help file. 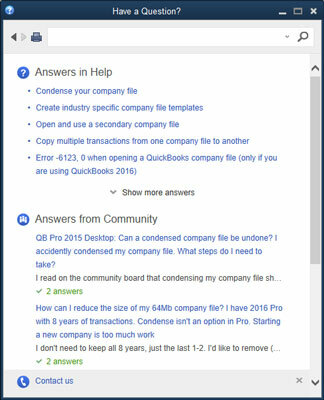 To find information in the QuickBooks Help file, choose Help → QuickBooks Desktop Help to display the QuickBooks Help window, as shown here. Enter the word or phrase that you want to look up in the search box at the top of the Help window and then click the button that looks like a magnifying glass. QuickBooks displays a list of clickable links that may help you with whatever problem you’re having. The figure shows a list of Help topics related to the issue of working in a multiple-currencies situation. 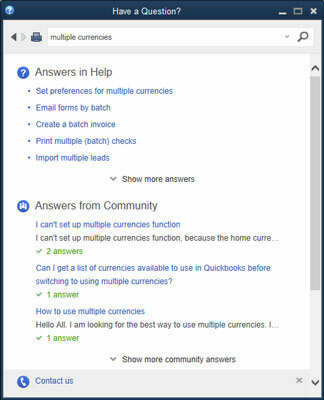 Another really good resource for troubleshooting is Intuit’s product-support website for QuickBooks. 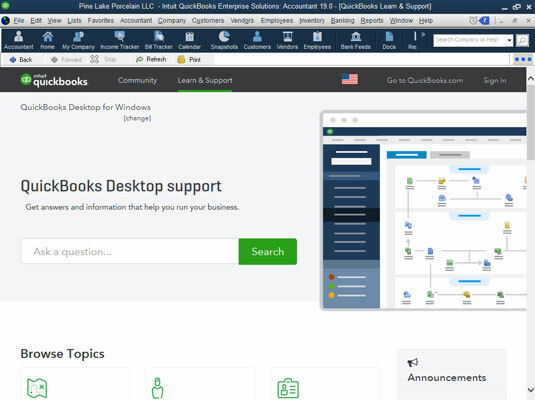 This website (see the figure), which you can visit by entering https://community.intuit.com/quickbooks-desktop in your web browser or by choosing the Help →Support command within QuickBooks, is a rich database of troubleshooting information. The QuickBooks Desktop Support website. To use the site, enter your question or keywords from your question in the search box at the top of the window and then click Search (the magnifying-glass button). The product-support website displays a list of troubleshooting articles that may help solve your problem. 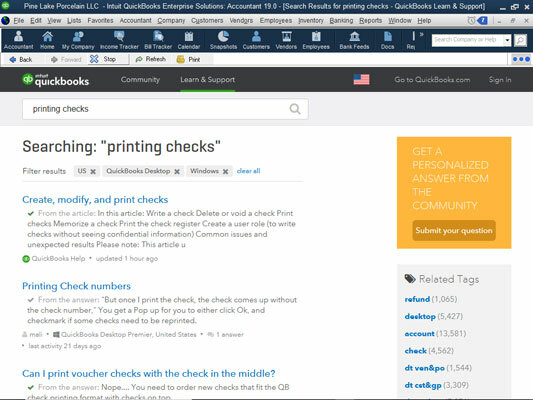 QuickBooks support articles about printing checks. Keep in mind that your problem may not be a problem with QuickBooks at all, but a problem with your computer and its hardware or with Microsoft Windows. The Microsoft product-support website is phenomenally rich in information. If your problem stems from the hardware or the operating system, you can consult the hardware or software maker’s product-support website for troubleshooting information. Usually, you can find the hardware maker’s product-support website easily by using a good Internet search engine. To locate Dell Computer’s product-support website, for example, type something like HP Computer product support in a search engine such as Google. When the search engine searches on that phrase, it almost inevitably finds the URL (the address) of the vendor’s product-support web page. You can find troubleshooting information about Intuit products at the Microsoft product-support website. If the solutions that the site offers aren’t very reassuring, at least you can find out whether other users have experienced the same problem. Microsoft may simply suggest that you contact the vendor (Intuit, in this case) or that you upgrade to a newer version of the QuickBooks software. Often, however, it’s useful simply to know that the problem you’ve encountered is a real problem that Microsoft has logged into its product-support Knowledge Base and described in some technical detail. Professional adviser: You can contact a QuickBooks professional adviser via the QuickBooks website. In a nutshell, QuickBooks professional advisers are people (often, accountants and consultants) who signed up with Intuit to get copies of the QuickBooks software at a discount price, a listing on the QuickBooks product-support website, and access to special training. (Some of these people also take a test and pay extra money to be listed as certified advisers.) You pay these professional advisers their usual consulting fees, but let me suggest that this support option can be very useful when your problem isn’t so much a technical problem with QuickBooks as it is a problem with how to use QuickBooks to solve some accounting issue. If you try at least a few of the preceding troubleshooting tactics and can’t get an answer, here’s one other suggestion: Bite the bullet, call your CPA, and get him or her to help you through the rough patches. You’re going to pay $200 an hour or whatever. And you paid — what, only a few hundred bucks for QuickBooks in the first place? But here’s the deal: Your accounting system is an essential business tool. It must work smoothly and correctly to produce the information you need to operate your business successfully. Paying for an hour or two of expert, onsite, personalized accounting expertise can be a great investment. And what if your accountant doesn’t or can’t provide this sort of assistance? Well, shoot, you should find somebody who does and can.